Turkish SoulCat, kunfu und Whoarei | Vinyl 41 - Platten uvm. Huch, da sind wir ja schon bei Tapes #3 angekommen. Nach den ersten beiden Runden geht es jetzt weiter mit Turkish SoulCat, kunfu und Whoarei. Alle drei Kassetten sind wieder vollgepackt mit smoothen Beats und jazzigen Samples. „Vibrations is a collection of songs I made between 2016-2017. Vibrations starts in the morning, “Early In The Morning” — to me this song and the last song “You Are Love” represent everything I would like to say and do with my music. Share love in a sincere and psychedelic way. Soul samples chopped to say things they didn’t originally say. Secret messages and whispers hidden behind heavy bass lines and pretty chords….Despite first impression of the black and red album cover Vibrations focuses on the light….pink noise..and is really just 40 something mins of music about love. 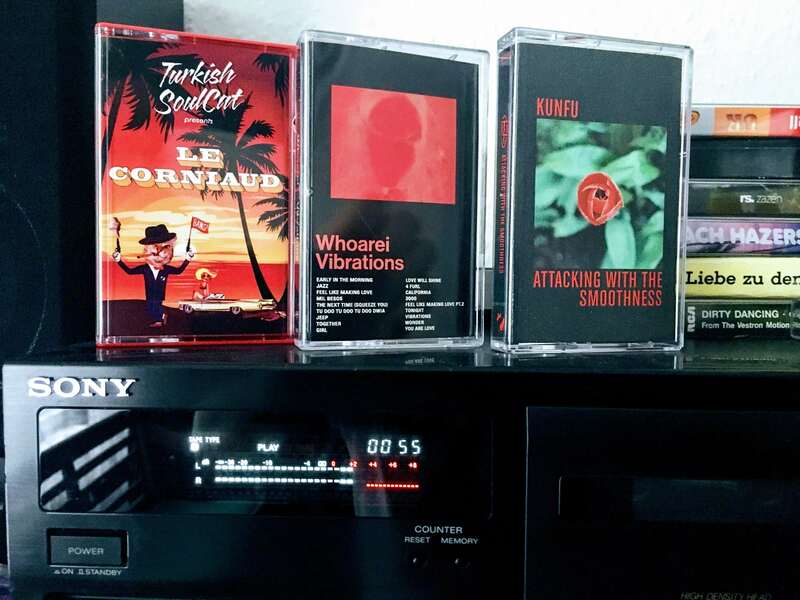 Auch der dritte Schwung an Tapes macht richtig viel Spaß. Besonders gut gefällt mir „Le Corniaud“ von Turkish SoulCat. Hörspielfeeling mit Louis de Funès trifft auf satte Beats, was will man mehr?! Immer her mit Euren Tapes. #4 wartet schon.